Gold medal winning Olympian, Sir Ben Ainslie, celebrated the achievements of 49 apprentices from the superyacht sector at the recent British Marine Federation’s (BMF) Apprenticeship Graduation (Tuesday 16 September). Those graduating have all successfully finished their apprenticeships with members of Superyacht UK, a group association of the BMF. 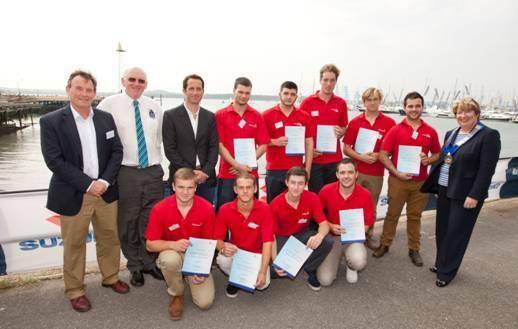 Taking place at the PSP Southampton Boat Show, 55 graduating apprentices in total from all areas of the marine industry were presented with their awards by the America’s Cup sailor. The British Marine Federation (BMF) Apprenticeship Graduation is now in its fourth year, rewarding apprentices in roles varying from marine engineers’ right through to riggers and carpenters; recognizing the diversity of accessible skills and careers in the marine industry. Yacht building company, Green Marine, with an apprentice scheme running for over 20 years, where apprentices or ex-apprentices make up at least 10% of the entire workforce. One former graduate is Jason Carrington, world renowned sailor and build manager. Builder of superyachts, Pendennis, has been taking on apprentices for over 15 years and has trained over 150 apprentices. Just under one third of the current workforce started off their careers as apprentices. Sunseeker International, UK builders of the world famous motor yacht has recognized the benefits of developing apprentices for over 35 years, training on average 70 apprentices annually. News that Sir Ben Ainslie has had a $12.4 million government grant to boost the marine industry by training apprentices, as part of his current bid for a British America’s Cup team, made this year’s BMF graduation event its most exciting. Sir Ben Ainslie, who presented the certificates to the apprentices, was keen to be involved in rewarding the students for their hard work, innovation and the value they bring to the future of the marine industry.